This question often comes up in a real estate transaction, "What's included in the sale?" or "What's not"? It's very important to ask these questions with your RealtorBEFORE you write an offer, and if you aren't sure, confirm with the Seller. Personal property can get a little tricky, so here's some basics to help you sort through it. Curtain RODS convey with the home. Curtains themselves DO NOT. As a general rule, if property is fixed to a wall with screws, nails, orbolts, it's part of the structure and will convey with the property. 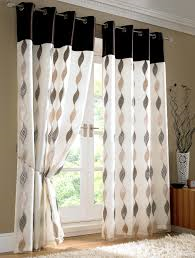 If you love the curtains there is a good chance that the Sellers may not be usingthe exact same ones at their new home, and may leave them as a courtesy if you ask. But you MUST ask for them in the contract, or expect to have bare windows when you move in. In a majority of transactions, some appliances will convey with the property. The most common appliances to be included are stoves, refrigerators and dishwashers. Don't just assume the microwave, air conditioner, dehumidifier, washer and dryer are being left behind for youjust because you see them at the home when you view the property. Be sure to confirm what the Seller is including in the sale, and understand that any other item you wish to have conveyedmust benegotiated. So, what about woodstoves, hot tubs, snow blowers and lawn mowers -- These items are also occasionally included in the sale, with the most common ones being wood stoves and hot tubs. Some lenders prefer to haveaccessory items such as lawn mowers and snowblowers NOT included as part of a purchase and sale contract. So if you are going to ask for them, youmay want to confirm with your lender that it's acceptable prior to writing them in a contract. What aboutthe bedroom set of furniture?When it comes to large amounts of furniture, this MUST be handled outside ofthe real estate purchase and sale contract.You can ask your Realtor for guidance on when theappropriate time will be to negotiate the possible purchase of furnishings that the Seller maybe leaving behind. And as a Seller, what if you wish to dig up Grandpa's rose bush to bring to the new house? Trees, plantings and shrubbery that are in the ground are considered to be part of the property and convey with the property. Occasionally we do have a Seller that will ask to bring a lilac or rush bush, or some special plant with them to their new home. This must be disclosed to the Buyer and written in the listing information. 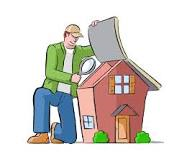 The seller will also need to repair any hole made and re-seed the area if necessary as a courtesy. Lastly...ceiling fans, fancy chandeliers and lighting: Lamps do NOT stay with the home as part of the purchase, but all other lighting fixtures that are afixed to walls are conveyed with the property unless otherwise specified by the Seller. If the seller is taking a special chandelier to hte new house, then they must purchase a replacement light fixture to be included in the sale. Have fun shopping for homes this spring and remember....ASK FIRST and then WRITE IT IN THE CONTRACT! 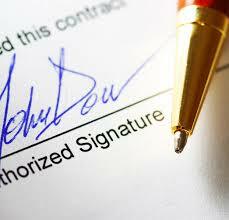 You might not need a pen the next time you sign a contract! New for 2014formany Vermont Realtors is the software Dotloop, where real estate agents will have access to Vermont Real Estate forms that can be electronically signed by parties involved in a transaction. So how does this impact you, the buyer or seller in a transaction? Well, according to the ELECTRONIC SIGNATURES IN GLOBAL AND NATIONAL COMMERCE ACT that was signed into law in June of 2000, signing a document electronically is legal and binding. However, in many real estate transactions, there are a lot of papers to review and signing these documents electronically may be quite overwhelming. Especially if you are a first time home buyer or seller, you may need things explained in detail, or just wish for some face-to-face time with your Realtor for such an important decision. This is completelycompletely understandable. However, if you are an investor who is very familiar with the process, or someone that travels a great deal and really wants to be able to conduct business and keep the transaction moving along, e-signatures can be a true blessing! I personally usually use a hybrid, where I meet with clients first and explain all the documents and have them sign in person if applicable, and then use Dotloop for any additional subsequent addendums or forms that come along that require less explanation. This was very helpful over the holidays where a majority of my clients were traveling and greatly appreciated not having to get to a printer/scanner/fax in between visits with family. Everything could be handled via their devices. Let us know how you feel about electronic signatures! Is this a convenience or something that makes you uncomfortable? Do you have any other experiences with electronic signatures? Feel free to comment on this blog or onour facebook page https://www.facebook.com/VermontGreentreeRealEstate. Northwestern Vermont Board of REALTORS Releases May 2012 Market Statistics The Northwestern Vermont Board of REALTORS has released its real estate market statistics for May 2012. The information is derived from data contained in the Northern New England Real Estate Network and covers Chittenden, Franklin and Grand Isle Counties. Pending sales are up over last year 22.1 percent. Inventory levels continue to shrink in May down 13.9 percent to 1,137 units. Prices moved higher. The median sales price increased 4.3 percent to $245,000. May 2012 Quick Facts Monthly Indicators Current as of June 11, 2012. Data is refreshed regularly to capture changes in market activity, so figures shown may be different than previously reported. All data from NNEREN. + 4.3% 1-Yr Change in Median Sales Price Combined with reliable sales volumes, fewer active listings have translated into competing bids on existing inventory and modest price gains in select neighborhoods. Informed sellers have noticed some homes selling quicker and for closer to asking price. Home searches are turning up far fewer results than in recent years. National headlines mask regional variability. With fewer distressed properties selling, prices are effectively melting up due to less downward pressure. May looks pretty good all around. 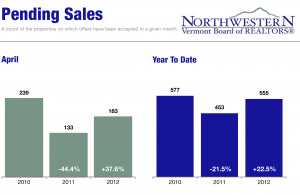 New Listings in the Northwest Vermont region decreased 7.5 percent to 310. Pending Sales were up 22.1 percent to 182. Inventory levels shrank 13.9 percent to 1,137 units. Prices moved higher. The Median Sales Price increased 4.3 percent to $245,000. Days on Market was up 3.8 percent to 116 days. The supply-demand balance stabilized as Months Supply of Inventory was down 27.3 percent to 8.9 months. In economic news, May's jobs report was disappointing, and there's a growing concern about the pace of domestic growth. Last month was also unsettling for investors, prompting some to hunt for better returns in the housing market. This forces other consumers up the price ladder. In politics, the Senate approved a 60-day National Flood Insurance Program extension. But with campaign season upon us, major housing-related bills or policy shifts are unlikely. The Northwestern Vermont Board of REALTORS has released its real estate market statistics for April 2012. The information is derived from data contained in the Northern New England Real Estate Network and covers Chittenden, Franklin and Grand Isle Counties. The average sales price for single family homes continues to adjust in the three-county area, showing a one-year change of -2.8%, or down to $269,410. Activity is strong, however. Pending sales increased 37.6% over last year. Days-on-market dropped to 117 days. Year-to-date inventory levels and the months supply of inventory also dropped. REALTORS continue to be very busy. said Kathy Sweeten, executive vice president of the Northwestern Vermont Board of REALTORS. Properties priced right are moving quickly.